Let’s admit it… it’s embarrassing having missing teeth. 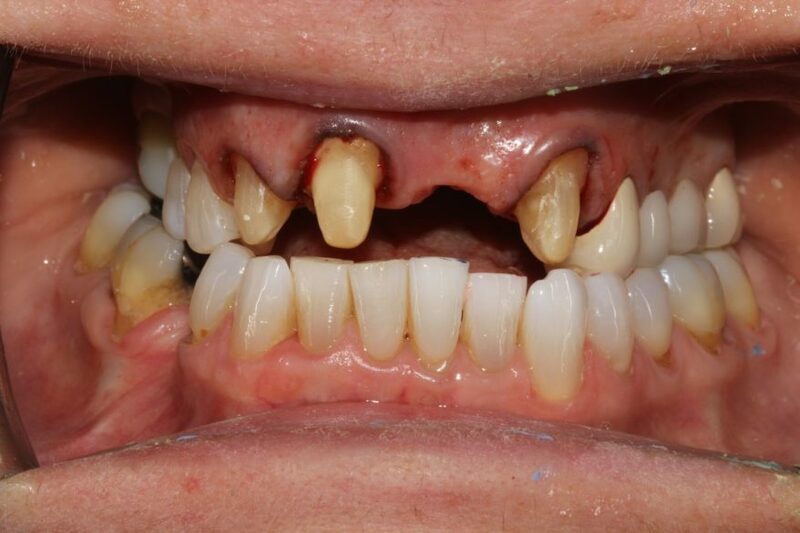 There are further concerns about missing teeth than just the cosmetic aspect of it though. Health risks are involved in not replacing them. Several corrective procedures are however available to mitigate this. Let’s first look at some possible causes of the loss of teeth. Gingivitis is caused by a build-up of plaque and bacteria. Symptoms are swollen and/or inflamed gums that may progress into bleeding. If detected early, it is treatable, but if left untreated it could develop into a much more serious condition called Periodontitis. Periodontitis is a gum disease that penetrates the gums and causes cavities between the teeth and gums causing separation. This could result in irreversible damage and teeth having to be removed. Daily brushing and flossing are essential to healthy teeth and gums. Failure to do so could result in gum disease and tooth decay. Sugar, carbohydrates and acid are a primary cause of tooth and gum decay. Steering clear of foods that have a high content of any of these three elements will prevent deterioration of the teeth and gums. Smoking, drinking alcohol and drug use are the prime suspect in contributing to bad dental health. Ignorance is in fact not bliss in this regard. Children especially need to be educated in healthy dental practices like brushing and flossing daily. “Prevention is better than cure”, as they say. Embarrassment in seeking professional help often leads to further loss of teeth. Dentophobia is real. People have such an intense fear of visiting a dentist that they would rather allow their teeth to decay than must withstand the anxiety of visiting a dentist. This occurs in people of all ages. A study showed that 39.6% of people have a fear of visiting the dentist. 10.8% of these people have actual Dentophobia. The embarrassment of poor dental health also plays a role in the lack of dental care. Individuals feel that the accountability of their dental habits are best left avoided. Having a tooth damaged or knocked out by some accident can be a traumatic experience. This is common in sports. Children are also susceptible to losing teeth through injury since their gums and teeth roots are still in development stages. Medical treatments such as chemotherapy, radiation and immunosuppressive treatments could also influence dental health due to the breakdown of the immune system. Chemotherapy affects the soft, moist lining in the mouth as well as the salivary glands. Providing dental implants is a procedure that interfaces artificial teeth with the jaw bone. They are installed in the form of a bridge, a crown, dentures or an orthopaedic anchor. When a crown is fitted, the outer layer of the tooth is filed away, and the artificial tooth is glued over it. This looks perfectly normal and natural and will stay in place for a long time if no trauma occurs. In the case of a bridge, two crowns are placed over the teeth on either side of the missing teeth or tooth, with the constructed tooth/teeth between them. This procedure has proven to be very successful and durable & can last for many years without any further complications. Ignoring the symptoms of Edentulism could have a negative impact on one’s life. Daily hygiene and regular maintenance could prevent a lot of pain and embarrassment. Finding the right dentist or specialist could be the solution to some of the problems mentioned above. As much as a visit to the dentist is an intimidating and scary experience, it is well worth avoiding the repercussions of not making the effort to do so. Find a dentist who makes you feel comfortable or take a loved one with you to the consultations to get the job done if necessary.